Did you check out The Wedding Fair in Calgary this past weekend? If you didn’t have a chance to stop by and say hi (and try some delicious soup samples…) at our special booth, check out the photos to see this years’ display, and steal one of our recipes for your own kitchen. Our very own Chef James Nielsen whipped up a delicious Roasted Parsnip and Okanagan Apple Soup for those who had bridal on the brain, and our soup samples went fast. There were 150 litres and over 2,000 cups of soup distributed! In case you didn’t have a chance to sip, or if you loved it and wanted to make it at home, here is Chef James’ recipe for delicious. 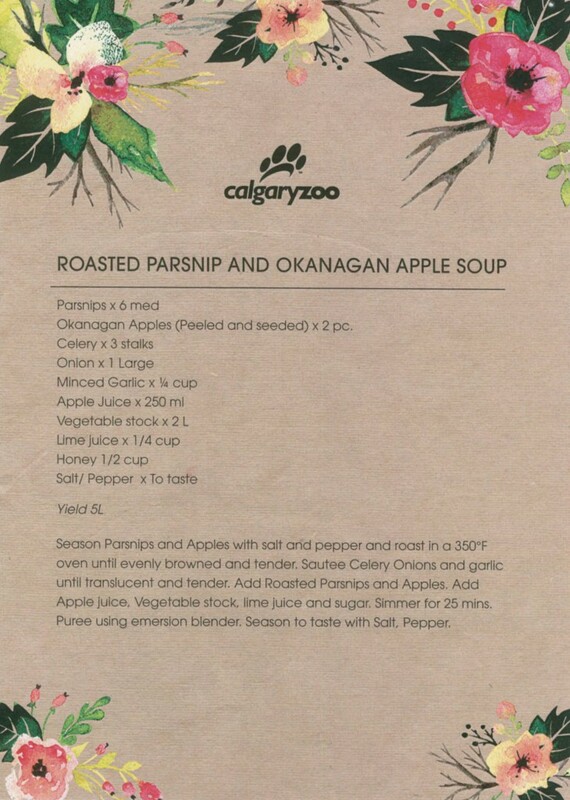 Roasted parsnip and Okanagan apple soup was a hit at the Wedding Fair 2016 Calgary Zoo booth! If you were feeling inspired by the booth, or wanted to follow up on a chat that you had with one of our Event Sales team members, don’t hesitate to check out all things wedding at the zoo on our website. Whether it’s a small gathering in a rustic-chic venue, or a large affair amid exotic plants and fluttering butterflies, we have something for your wedding here at the zoo.